Seriously, look at this kitchen!!! Would you not be in love with it too? The stove! The full-sized oven, the griddle in addition to burners! A dishwasher! I am going to cook so many amazing meals in it. Just you wait! So I couldn’t turn up empty-handed last night and what says “thank you for trusting me with your awesome house while you’re in Boston” better than homemade bread? While I don’t have a garden, my boss at the Beckett Project does and when she gave me a little bunch of fresh rosemary, basil, and marjoram, I knew it would have to go into a loaf. Later that night I chopped the herbs up as finely as I could, used Martha Stewart’s rosemary bread recipe as a base, and mixed it all together in my mixer, let it rise, then baked it. While I’m still no pro at shaping bread, I’m happy with the crumb and the flavor. It’s dense enough to use as sandwich bread, but not too dense. I’d happily eat it dipped in some olive oil. And the combination of rosemary, marjoram, and basil turned out well-balanced with just a hint of each coming though. Stir together yeast and the warm water in the bowl of an electric mixer. Let stand until foamy, about 7 minutes. Add 3/4 cup water, the olive oil, sugar, salt, chopped herbs, 1 1/2 cups all-purpose flour, and the whole-wheat flour to bowl. Fit mixer with the dough hook; mix on low speed until dough comes together, about 1 minute. Raise speed to medium-high; mix until dough is smooth and elastic, 8 to 10 minutes. Lightly oil a large bowl. Shape dough into a ball, and transfer to oiled bowl. Loosely cover with plastic wrap. Let dough rise in a warm, draft-free spot until doubled in bulk, about 1 hour. Loosely cover baking sheet with plastic wrap, and let loaves rise slightly in a warm, draft-free spot 30 minutes. Meanwhile, preheat oven to 400 degrees. Dust loaves with remaining teaspoon all-purpose flour. Bake until golden, about 30 minutes. Let cool completely on a wire rack before slicing. Drooling over the kitchen, and the bread! hooray for a tasty avocado-artichoke heart-tomato-horseradish sammie, the most glorious house (that kitchen has me so jealousfaced), and getting to relax away from the super hot city for a few days! w00t! 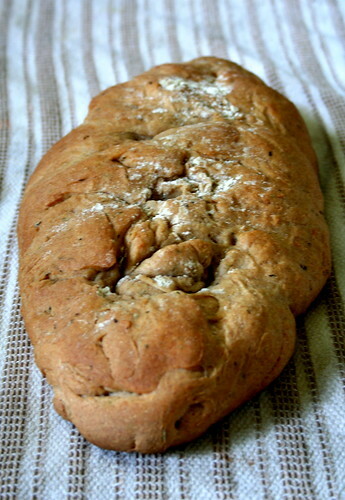 your fresh herb bread looks amazing & oh-so awesome! yay! We are so glad that our kitchen will be so well used while we are away, Jes. Thanks for making the trip up to the ‘noke: it is reassuring to know you’ll be here. Oh, and ask Beth for the Vegan scone recipe she tested out tonight – it rocks! I love the shape of that bread. It looks really special! And that is indeed a great kitchen. Love the new kitchen! Your trip to Roanoke sounds like an enjoyable one. Oooh, you are going to love staying in this place! I would absolutely live in that kitchen. And I would eat a sandwich like you had all the time – it sounds super tasty. You were sweet to bring that amazing homemade bread. It’s an adorable kitchen to be sure, but I’d still prefer the bread! Sounds like excellent garlic bread material, too. That kitchen looks great. I love the colors, very retro. I cant wait to see what you will create in that room! weird, definitely! man, facebook knows too much, or maybe it’s the few friend I friended through vegan etsy? 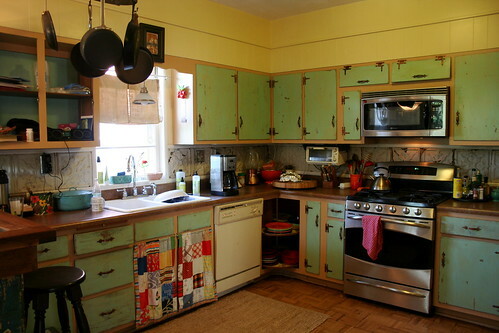 *shrug* dunno, but in other news your kitchen is adorable! And I like how your bread looks like it’s been swirled with fingers… I haven’t made herb bread since I was little, maybe I’ll have to give it a go soon! Gawd that kitchen is gorgeous!!! Wowza!! Lucky duck!